Adjustable rear closure and lace top allows the headgear to be form fitted. The efficient design narrows potential target surface-- while providing a full range of vision. 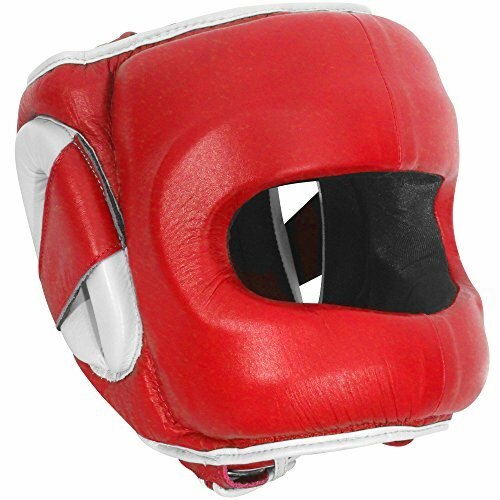 One of the most protective sparring headgears on the market. The Deluxe Face Saver thoroughly shields the head, preventing punches from making direct contact with the face. The efficient design narrows potential target surface while providing a full range of vision. An adjustable rear closure and lace top allows the headgear to be form fitted. It is made entirely of durable leather with a buckle chin strap. The moisture wicking liner aids in quick drying while keeping the head cool and comfortable.